New Delhi: Vaibhava Srinivasan, 33, was flying a Boeing 737 aircraft over the picturesque Himalayan mountain range on his way to China, when he had to suddenly cut short his sortie for an urgent board meeting at office. On weekdays, the Bengalurean works as a chartered accountant with PricewaterhouseCoopers, but on weekends, he brings out the aviator in him and ‘flies’ all kinds of jetliners all over the world with the help of software — the Microsoft Flight Simulator. The software, priced at $40 (Dh147), commands the lion’s share in the virtual flying software market. “This software is for enthusiasts and has been constantly upgraded over the years. It provides you a virtual experience of flying a jet and is easily available at any electronic gadget or video game shop,” Srinivasan said. 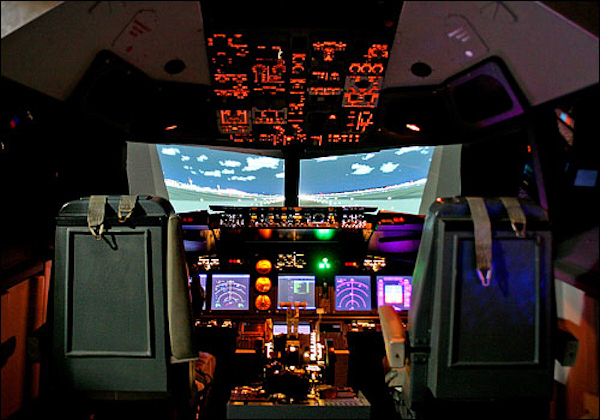 Srinivasan, in fact, went one step further by installing a Boeing 737 cockpit at his home with hardware and software procured from various countries over a period of two years. The cockpit boasts of an imitation panel, yoke, throttle quadrant, multi-functional displays, auto-pilot and auto throttle panels and original captain seats. “After slugging the whole week I need an effective stress-buster on weekends to relax and the simulator is just the perfect solution. In fact, many of my friends often visit my place just to lay their hands on it,” he said. Srinivasan may be an extreme case, but budding aviators can also consider software like X-Plane, which costs around $25-40, depending on the features one opts for. Siddharth Chowdhri, who owns The English Book Store in central Delhi’s upscale commercial complex Connaught Place, says flight simulator software and hardware like yoke and throttle quadrant are some of his best selling items. “Over the years, our clientele has changed. Earlier, most of our customers of such software were students training to become pilots, but now enthusiasts have also started thronging our shop,” he said. “Much of the stuff is directly imported from the UK and US,” he added. Virtual flying enthusiasts also have another option — the International Virtual Aviation Organisation (IVAO), the biggest non-profit community of virtual flyers and air traffic controllers, based in Belgium. “IVAO provides a platform for virtual pilots and air traffic controllers from across the globe with real time data on weather and traffic conditions of the destination that you are headed towards,” said Srinivasan, who is also IVAO’s director of public relations. After a free registration at IVAO, customers can download software for pilots or air traffic controllers and get started immediately. Sanket Deshpande, a media professional from Mumbai, termed the experience as “out of this world”. ‘Once you start flying, it’s difficult to believe that it is just a simulation. The most amazing thing is that you can interact with fellow pilots who are flying with you in the virtual airspace,’ the 26-year-old said. Delegated with the responsibility of coordinating operations of air traffic control and new members joining IVAO, Deshpande said 25-30 enthusiasts are joining them every month. “The age-group usually varies between 16 and 45. We also have retired air force pilots as our members,’ said Deshpande, who is in the process of building a cockpit at home. “Although both the organisations are equally large, VATSIM has more American users whereas IVEO boasts of more Europeans and Indians,” said Srinivasan. Some also say the flight simulators can be the first step towards a career as a pilot or an air traffic controller. “The problem in India is that parents think that it is just another video game and discourage their kids from using it, whereas it can very well be a beginning for a kid to shape his career as a pilot,” Hyderabad-based Ajit Menon, a sales manager with Dell, said. “Although it’s a rage in the West, it is growing at an equally healthy rate here,” added Menon, 40, who claims to have more than 2,000 hours of virtual flying under his belt.